A few weeks ago I was happily reading my copy of the magazine Australian patchwork and Quilting, which I take monthly, and to my surprise I found an article on a group of ladies known as the Betty’s. They had been making quilts adapted specially for people to wear in a wheelchair and donating them to groups with neuro-muscular conditions. 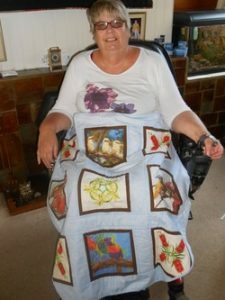 For those of you who do not know me, I have a neuro-muscular condition and although I have been quilting for over 20 years had always had difficulties when wearing a lap quilt trundling along in my power chair. They catch the front wheels as you are going along and also fall down (I cannot feel this happening!) and they end up under the wheels with severe consequences to both the quilt and me. I e-mailed the contact details for the Betty’s to find out how they had made their quilts. It was so easy and yet something I had not thought of. It is a 36” square quilt with 2x 9” triangles cut off the bottom corners, leaving 18” in the centre. For those who move around a lot the addition of ‘apron strings’ on the top of the quilt tie around the waist. So simple but I had never thought about it before. As I am so busy with the Truro Cathedral quilt I decided to make one for myself when this project was finished. I also thought of others I know who could benefit from one and I would make more for them. I was surprised a few days later when I heard from the editor of the magazine to ask if they could print my letter to Betty in one of their upcoming magazine!!! I gave permission for this and thought that the subject was now closed. Imagine my surprise when the following week I received an e-mail from Betty to ask for my home address saying I was in for a surprise. 2 days later a delivery person arrived with a package from Australia! Inside was a wonderful quilt with an Australian theme of birds taken from a calendar and flowers which Betty had machine embroidered herself. It is of the kookaburra, honey eaters and a lorikeet and bottlebrushes and wattles. I consider myself a very lucky person having this made especially for me. I now know how people who receive quilts from Project Linus and other charities feel. It is lovely and warm and stays on as I go out. Lucky me!!!. For any one of you who make quilts for charity please consider using the idea to make special quilts for wheelchair bound people you may know or for projects like the MS Society, Muscular Dystrophy etc.